Sometimes the oddest correlations make the best forward-looking indicators. This is certainly the case with lumber and the housing market. Here’s what this odd but accurate indicator ‘sees’ ahead for U.S. real estate. Several times in the past we’ve looked at the correlation between lumber and housing – related ETF: iShares US Real Estate ETF (NYSEArca: IYR). It’s an off the wall kind of an indicator, but it’s proven more accurate than any other housing indicator. To get the correlation right, we need to set lumber futures forward by about 14 months. 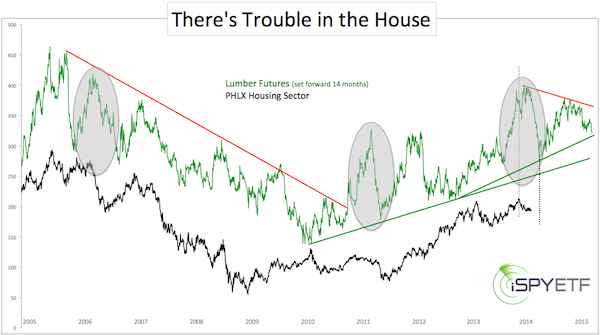 The chart below does just that, as it plots lumber against the PHLX Housing Sector Index. As the gray oval on the right shows, lumber saw a big pop and drop in 2012/2013. The two gray ovals to the left illustrate that the magnitude of such sizeable pops and drops tends to appear muted in the housing sector, nevertheless it suggested an eventual slowing of the housing market. Lumber is currently at an interesting juncture, as lumber prices were unable to break above resistance and just fell to test support. As of right now, lumber suggests that the housing market is not ‘out of the woods’. The housing blues may start all over if support for lumber fails. This would not only affect multi-billion dollar ETFs like the Vanguard REIT ETF (NYSEArca: VNQ), or SPDR Dow Jones REIT ETF (NYSEArca: RWR), but also millions of Americans. A proprietary analysis of supply and demand for the SDPR S&P Homebuilders ETF (NYSEArca: XHB) also shows that demand for homebuilding stocks is deteriorating. The VIX is trading near 7-year lows and two VIX ETFs are at all-time lows. Many are itching to buy the VIX and while such a trade may well be profitable, VIX seasonality provides another layer of information for a low-risk trade. When is the best time to buy or sell the VIX or VIX ETFs/ETNs? There are multiple ways to find decent entry points. The effectiveness of every single one of them can be enhanced by VIX seasonality. Consider seasonality another layer of tradable information, just as you may use a mobile weather app to crosscheck what the meteorologist says on local TV. The VIX seasonality chart below is based on daily VIX data from 1990 – 2013 and was featured in the May 21 Profit Radar Report (Profit Radar Report subscribers get complimentary access to carefully crafted seasonality charts for the S&P 500, Apple, gold and VIX). A major seasonal VIX low is usually due towards the beginning of July. Major tops tend to form in October. Currently the VIX is flirting with a 7-year low. The iPath S&P 500 VIX ETN (NYSEArca: VXX) and VelocityShares 2x VIX ETN just slid to (another) all-time low. Based on the VIX’s depressed level and spread between current trade and the 50-day and 200-day SMA, it’s almost certain (based on historic precedences) that VIX will climb towards 15 sometime before September. It is tempting to buy the VIX at current levels (someone actually bought $13 million worth of VIX calls around 12, more below). Is this a good idea? The VIX is trading just around support at 12 and a number of indicators suggest a S&P 500 correction. Lower S&P 500 (NYSEArca: SPY) generally translates into higher VIX. However, the VIX seasonality chart cautions that we may see even lower VIX prices in early July. This doesn’t mean the VIX can’t rally now (based on some indicators it should rally), but seasonality cautions that any rally may be muted and/or reversed. Odds of a successful trade increase if we get another chance to buy the VIX at depressed levels in a month or so. Regardless of seasonality, one trader decided now is the time to load up on VIX calls, $13 million worth to be exact. Based on Bloomberg data, an unknown trader paid almost $13 million to buy VIX call options. Options provide leverage not available via ETFs or ETNs like the iPath S&P 500 Futures ETN (NYSEArca: VXX) or VelocityShares 2x VIX ETF (NYSEArca: TVIX). The trade will only be successful if the VIX rallies at least 56%. Contango incrementally and persistently eats away at long VIX trades (see below for explanation of VIX contango). At the beginning of the year, on January 28, an unknown trader placed an even bigger $18 million bet on a falling VIX. At the time the VIX traded around 19. In an article titled: “Record Bet: Trader Sells $18 Million in VIX Calls,” I outlined three reasons why this was a smart bet. 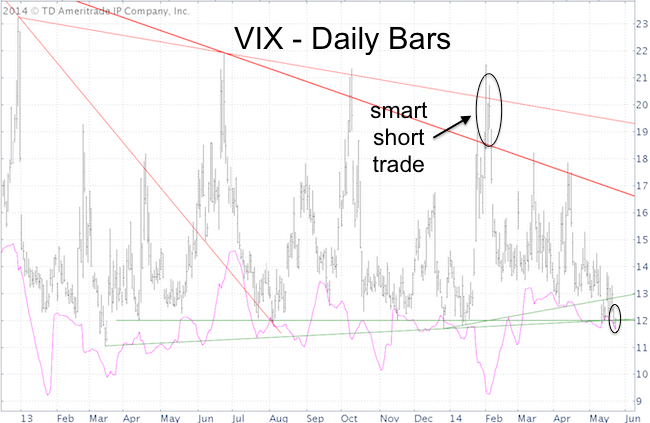 As the January 28 Profit Radar Report highlighted, VIX resistance was at 18.60 – 20.20. Going short against resistance always provides a low-risk entry (assuming a stop-loss is set above resistance). Contango: Contango provides head wind against bullish bets, but tail wind for bearish bets (click above link for detailed explanation of contango, and how much profit it erodes each day) . S&P 500 lows are often accompanied by VIX divergences, which means that the VIX often does not spike to new highs even if the S&P 500 (NYSEArca: SPY) drops to new lows. Obviously, the bearish $18 million bet in January paid off handsomely. I don’t think the odds of this bullish VIX trade paying off are as good. VIX seasonality has not yet bottomed and projects even lower readings. 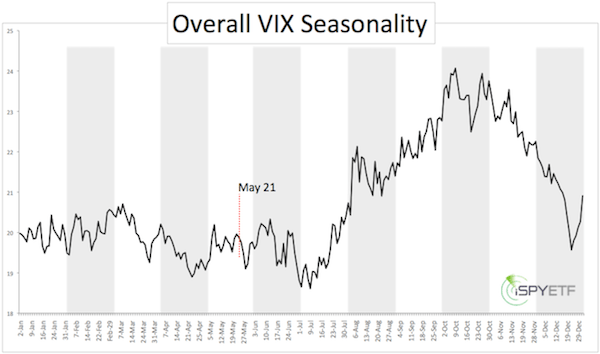 The VIX seasonality chart pinpoints the seasonal bottom and best time to buy the VIX. Nasdaq Back Above 50-day SMA – Bull Trap or Buy Signal? It’s been rare for the Nasdaq to spend an extended period below the 50-day SMA. 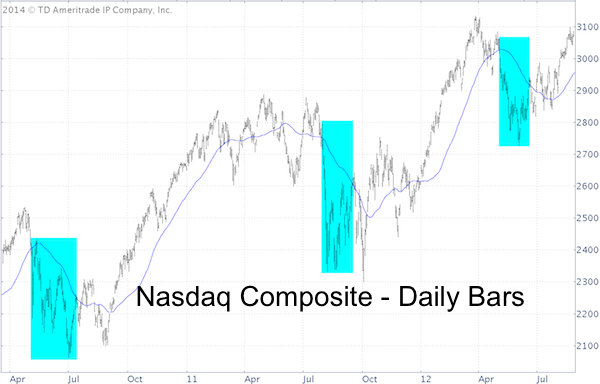 On Thursday the Nasdaq Composite closed back above the 50-day SMA for the first time since April 4. Is this bullish or a bull trap? 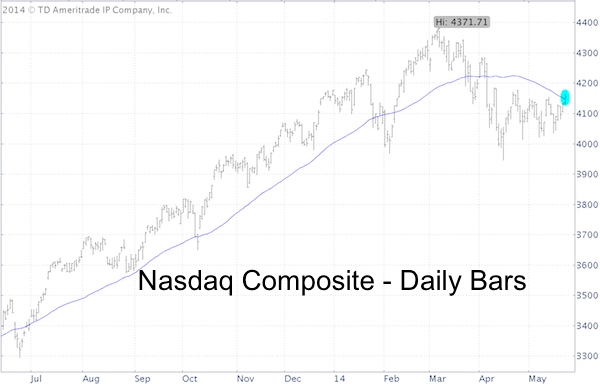 On Thursday the Nasdaq Composite (Nasdaq: ^IXIC) closed back above the 50-day SMA for the first time since April 4. Is this bullish or a bull trap? Since the 2009 low the Nasdaq hasn’t spent much time below the 50-day SMA. In fact, there were only four instances where it traded below its 50-day SMA for more than 30 days. The prior three occurrences are highlighted in the Nasdaq chart below. To be specific, the blue boxes show the time spent below the 50-day SMA including the first day back above. All three times saw an almost immediate pullback followed by higher prices. Twice the Nasdaq tested the prior low. A move above 4,180 for the Nasdaq Composite or 3,665 for the Nasdaq-100 (Nasdaq: QQQ) would invalidate a bearish technical formation and allow for higher prices. Perhaps more important than the 50-day SMA is an indicator that correctly signaled the 2000 and 2007 market tops. This trusty indicator is on the verge of boasting another sell signal. Are the implications the same as in 2000 and 2007? S&P 500: When Will the Trading Range Break? There’s a time to buy, a time to sell and a time to be patient. Most of 2014 falls into the ‘be patient’ category. What’s causing this extended trading range and how much longer can it go on? The S&P 500 has been struggling to break through technical resistance. 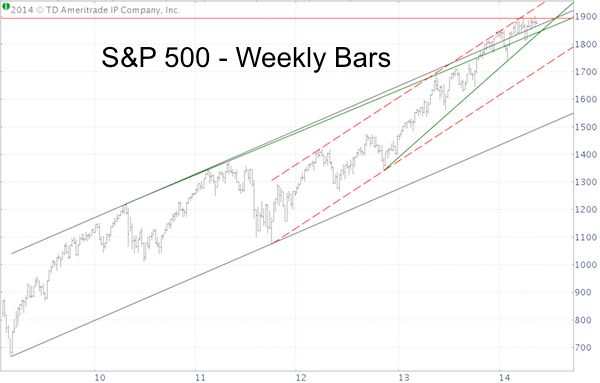 The dashed red trend channel and solid red Fibonacci resistance have clipped the wings of the S&P 500 every time it staged an attempt to fly above resistance. 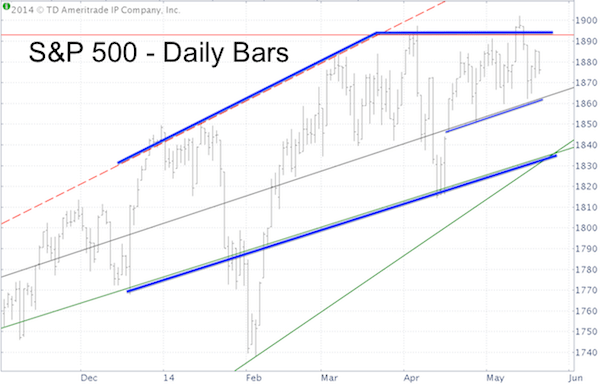 The first chart shows that aside from the January/February dip, the S&P 500 has been restricted to a range defined by predetermined support/resistance levels. The second chart provides the long-term context needed to make sense of the highlighted support/resistance levels. Obviously, the S&P 500 (NYSEArca: SPY) has bounced from technical support several times, but there’s been another reason why the S&P 500 hasn’t broken down. It’s the ‘media put.’ Unlike the ‘Bernanke put’ (now Yellen put), which is cash driven, the ‘media put’ is information driven. The media is the last entity qualified to dispense financial advice, but that’s exactly what they do. Unfortunately, enough investors are listening making the media a contrarian indicator. The S&P 500 rarely dances to the tune of the media’s whistle, that’s why the Profit Radar Report expected a pop and drop combo to fool the ‘here comes the crash’ crowd. When Will the Range Break? The pop to S&P 1,902 on May 13 certainly rattled the cage of premature bears. A break below key support (key levels outlined in the most recent Profit Radar Report) may usher in the long-awaited 10%+ correction. Could the correction morph into something bigger? One indicator with the distinct reputation of signaling the 2000 and 2007 meltdowns is at the verge of triggering another ‘crash signal.’ But there’s one caveat. Here is a look at an indicator that has the distinct reputation of signaling the 2000 and 2007 meltdowns. This indicator obviously has a decent track record, but is today’s environment the same is in 2000 or 2007? Is another crash likely? 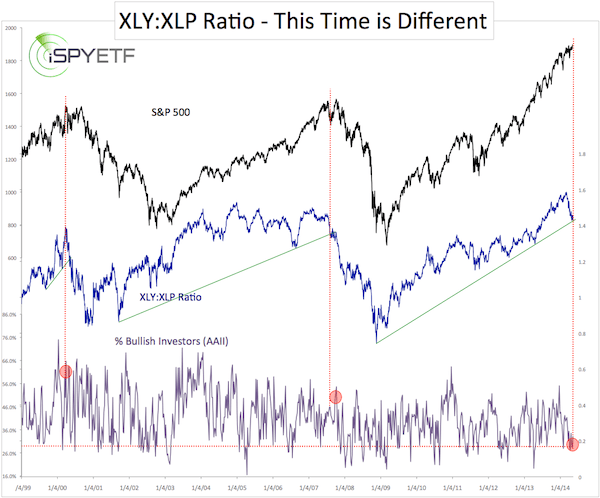 Here is a look at an indicator that has the distinct reputation of signaling the 2000 and 2007 meltdowns – the XLY: XLP ratio. XLY (Consumer Discretionary Select Sector SPDR ETF) represents a dynamic and economically sensitive sector of the S&P 500. XLP (Consumer Staples Select Sector SPDR ETF) represents a stable, boring and supposedly recession proof sector of the S&P 500. 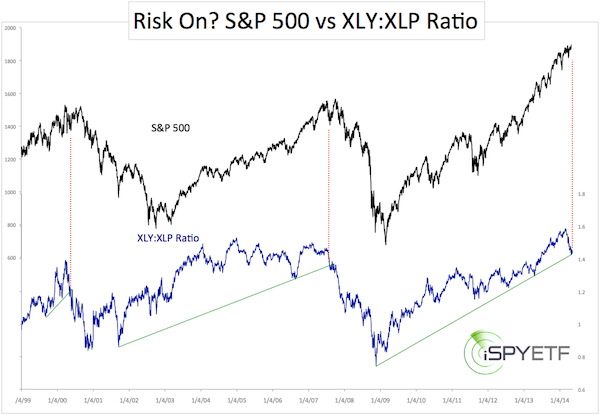 The XLY:XLP ratio shows which sector investors prefer, and as such serves as a historically accurate risk on/risk off indicator. The first chart plots the S&P 500 against the XLY:XLP ratio (I’ll call it XXR from here on). The green lines show that XXR respects trend line support. In fact, a break below this trend line support in 2000 and 2007 is what foreshadowed trouble for the S&P 500 (SNP: ^GSPC). This week, the XXR is exactly at trend line support once again. Extrapolating the past into the future would suggest another meltdown (assuming XXR will go on to drop below support). The second chart adds the percentage of bullish investors polled by AAII into the equation. For the past several weeks the Profit Radar Report has been pointing out that retail investors along with the media (or investors influenced by the media) have turned quite bearish. Is Today’s Environment the Same as in 2000 and 2007? I’ve added the % of AAII bulls to show that today’s environment differs from what we saw in 2000 and 2007. In 2000 and 2007 most market participants were bullish. Today they are not. It should also be noted that XXR’s 2007 break below trend line support came a few weeks too early and could have resulted in some annoying short-term losses as the S&P 500 (NYSEArca: SPY) staged its final rally leg. The XLY:XLP Ratio has done a decent job foreshadowing the 2000 and 2007 crashes, but the overall environment suggests that this time is different. There is not enough fuel (aka bullish investors) to drive the S&P 500 down substantially (more than 20%) and keep it down. 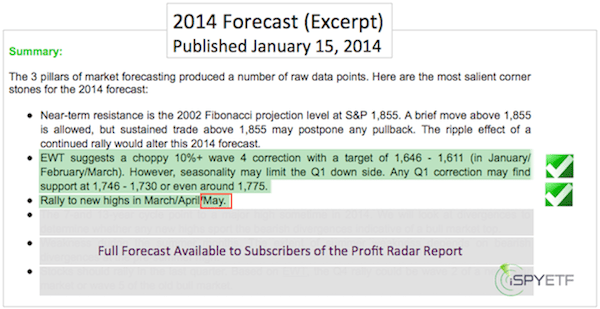 As mentioned above though, in the 2014 S&P 500 Forecast (published on January 15 via the Profit Radar Report), I projected a correction in May or June. This forecast remains valid. Contrarian Take: Did Doomsday Prophets Scare the Bear? Bears are powerful creatures, but they can get scared easily and may suffer from a fear similar to stage fright. Many media outlets have reported sightings of bears, but when everyone expects its appearance, it fails to show. Baron Rothschild’s famous adage, that the time to buy is ‘when there’s blood in the streets’, is timeless. History has also shown that the old adage is reversible, meaning that the time to sell is when there’s no sight of ‘blood in the streets’ or extreme optimism. Is there extreme optimism right now? Allow me to introduce my very own, non-scientific media sentiment indicator. A couple of weeks ago value investing icon Jeremy Grantham published his first quarter 2014 newsletter. The topic was a statistical approach to market bubbles. Yet, I could not find a single article that even mentioned, let alone highlighted, S&P 2,250, which is a pretty bold call. Is someone (hint: media) trying to spill blood on the street? 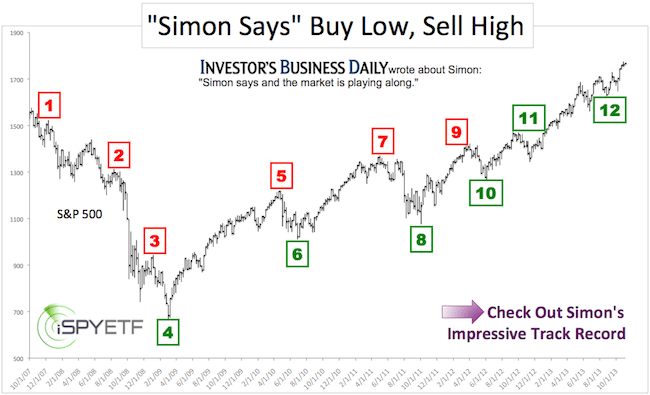 My research (S&P 500 2014 Forecast, published on January 15, 2014, available to subscribers of the Profit Radar Report) proposed a rally towards S&P 1,950 followed by a 10%+ correction back in January. We got an S&P 500 (NYSEArca: SPY) pop to 1,902.17 on May 13, but the headlines continue to be bearish. We’ll have to see if the pop was enough to fool the bears and set the stage for a deeper correction. I will be looking at key support and resistance levels for valuable directional clues.